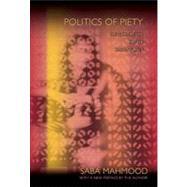 Politics of Pietyis a groundbreaking analysis of Islamist cultural politics through the ethnography of a thriving, grassroots women's piety movement in the mosques of Cairo, Egypt. Unlike those organized Islamist activities that seek to seize or transform the state, this is a moral reform movement whose orthodox practices are commonly viewed as inconsequential to Egypt's political landscape. Saba Mahmood's compelling exposition of these practices challenges this assumption by showing how the ethical and the political are indelibly linked within the context of such movements.Not only is this book a sensitive ethnography of a critical but largely ignored dimension of the Islamic revival, it is also an unflinching critique of the secular-liberal principles by which some people hold such movements to account. The book addresses three central questions: How do movements of moral reform help us rethink the normative liberal account of politics? How does the adherence of women to the patriarchal norms at the core of such movements parochialize key assumptions within feminist theory about freedom, agency, authority, and the human subject? How does a consideration of debates about embodied religious rituals among Islamists and their secular critics help us understand the conceptual relationship between bodily form and political imaginaries?Politics of Pietyis essential reading for anyone interested in issues at the nexus of ethics and politics, embodiment and gender, and liberalism and postcolonialism.